Our plastic photo jigsaw puzzles are absolutely perfect for small children! Plastic puzzles are far longer lasting, and much more durable than both our card or wooden jigsaws. Even though they are made of plastic, each is made to the same exacting standards of our standard jigsaws. The only difference is that instead of easily damaged card, the puzzle is cut from tough plastic. Begin by selecting the size of the jigsaw, then select the number of pieces and upload your photo! Sharing your photos and the memories they stimulate has never been easier! Ready to get started ordering your plastic photo jigsaw? It is really easy to do. 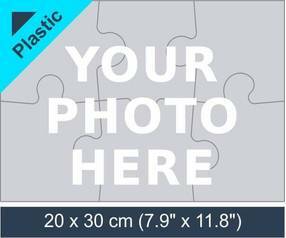 Select what size you want your puzzle to be, and then upload your choice of photo. Finally, decide how many you want to order to give away as gifts! A plastic picture puzzle is much stronger than a cardboard jigsaw. This makes the perfect for frequent use puzzles. We use 2mm think plastic to cut your jigsaw from, this makes them extremely long lasting and hard wearing. Perfect for children, or as gifts to give away as a business promotion. We have six different styles of plastic jigsaw available. These have different piece counts, so you can choose the one most suitable. For young children, we recommend lower piece counts. These are fully personalized plastic photo puzzles, using your own pictures. Get your business message across in a unique way! Plastic photo jigsaws make excellent promotional and marketing materiel. Sending a plastic picture puzzle to your clients or trading partners is guaranteed to get their attention. We can brand your plastic picture puzzle with your logo, or any other image you choose. This gets your corporate message under the eyes of the people that count. Every time they pick up and solve the puzzle, they will be reminded of your company, and the products or services you provide. Plastic photo puzzles are perfect for young children! Our plastic photo puzzles are completely safe for even the youngest child to play with. They are strong, and do not break easily. We coat the plastic of each puzzle with a waterproof layer, so they can be used in the bath, in the yard or at the beach quite safely. They are also immune to food and drink spillages! The plastic we make these photo jigsaw puzzles from can be cleaned using ordinary dish detergent. If they get muddy, covered in sand, or even chocolate, just drop them in to the sink when you clean your dishes, they will come out as good as new! A personalized, plastic photo jigsaw makes a great gift for children. Not only will they have fun solving the puzzle, they will also develop problem solving, and motor control skills at the same time. Choose a photo of a family pet, favorite toys, or of a family vacation to make the solving of the puzzle more rewarding for children. A plastic photo puzzle from PuzzlesPrint is sure to give your kids hour after hour of safe entertainment. What more could any parent ask for? Good, safe fun that keeps children amused and happy for a long time.